Update: Recently launched Fixate, the cookbook containing 101 recipes for 21 day fix eating plan. Learn more about Fixate cookbook in my review. Quick heads up – Don’t freak out at the length of this ingredients list. Sure, it’s pretty involved, but you’ll be able to prepare a ton of veggie burgers that you can then freeze and store (almost forever, really) when you crank out a batch. It’s well worth the extra time necessary to put all of these ingredients together. The first step to making the best veggie burgers you’ve ever had is to take all of the frozen veggies out of the freezer and give them a chance to fall out of it (maybe 15 minutes or so). Once that’s taken care of, you’ll want to add veggies, the coriander, the flour, the cumin, and the cayenne pepper to a food processor (seasoning it to your tastes) and then just obliterating the ingredients into a pretty rough paste. Here’s where you’ll add the sesame and sunflower seeds (and then turned up the speed to give it a number crank or two), at which point you’ll want to pull all of the mixture out and begin dividing it into roughly equal sized patties. Dust the patties with a bit of flour, slap them on a piping hot griddle or in a skillet (or out on the grill, if weather permits) and then give them a good 10 or 12 minutes to cook – flipping them about halfway through. 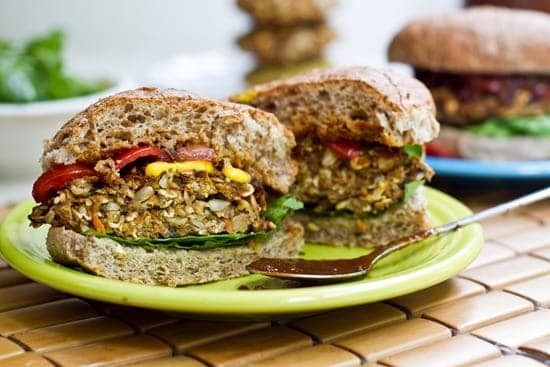 Prepare the rest of the ingredients in pretty much any way you like and then dress your veggie burgers accordingly! You are going to want to combine your breadcrumbs, 2 tablespoons of your Parmesan cheese, a single teaspoon of oregano, and salt and pepper (to taste) together in a small bowl to jumpstart this recipe. Once you’ve taken care of that, you’ll want to slice your tofu into as close to consistent quarter inch slices as you can, but don’t worry about being picture-perfect. Once you have sliced them, however, make sure that you immediately place them into a bowl of cold water. One by one, pull out the tofu pieces and then press them into your “breadcrumb mixture”, evenly coating all sides as you go along. Heat up a bit of oil in a medium-sized skillet over medium/high heat, and then cook until you’ve got one side of your tofu all crisped up. When you’ve got a good bit of browning going on, drizzle a bit more olive oil, flip the tofu, and do the same for each side. 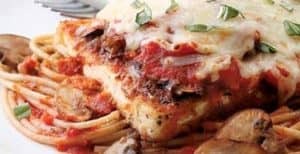 Now you’re going to want to combine tomato sauce, the basil and garlic, and any remaining bits of oregano together, placing a little bit of sauce in a baking pan. Arrange tofu pieces on the payment, and then spoon the rest of the sauce over the pieces. Top off with a bit of shredded mozzarella and the last 3 tablespoons of Parmesan before pushing the entire dish into your oven (preset to 400°F) and let it cook for 20 minutes. This recipe is as simple and as straightforward as it gets! Combine all five of the first ingredients broken down above into a medium-sized mixing bowl, really trying to mix everything evenly together. Once that’s taken care of, stir in a pinch or two of salt, and then pour the entire mixture into a Ziploc plastic bag. Add the chicken to the marinade, and then throw the entire Ziploc back into your refrigerator for at least two hours (but you can go all the way up to overnight if you are preparing this in advance). While your chicken is marinating away, make sure that you are soaking your wooden skewers in water – cold water – for at least 30 minutes. This is going to prevent them from burning. The last piece of this puzzle is to preheat your grill to about medium-high. 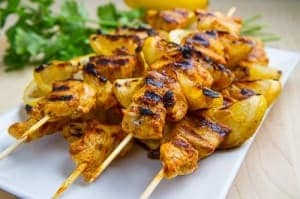 Remove your chicken from the marinade (throwing the marinade out – do not reuse it), and skewer the chicken on each stick. Grill up each side for about four minutes until they are well done and then serve with the yogurt! A recipe book especially designed for 21 Day fixers . Easy, Healthy and tasty recipes made with 21 Day Fix eating approved food. The 1st Edition has been downloaded more than 25,000 times. Now it’s time for a brand new 2nd Edition of the Days to Fitness Recipe Book. iBook Format, so it looks amazingly beautiful on your iPhone, iPad, and Mac. Includes the 3 best shakeology alternatives available on the market today. More than 9500 people have already downloaded their own copy. 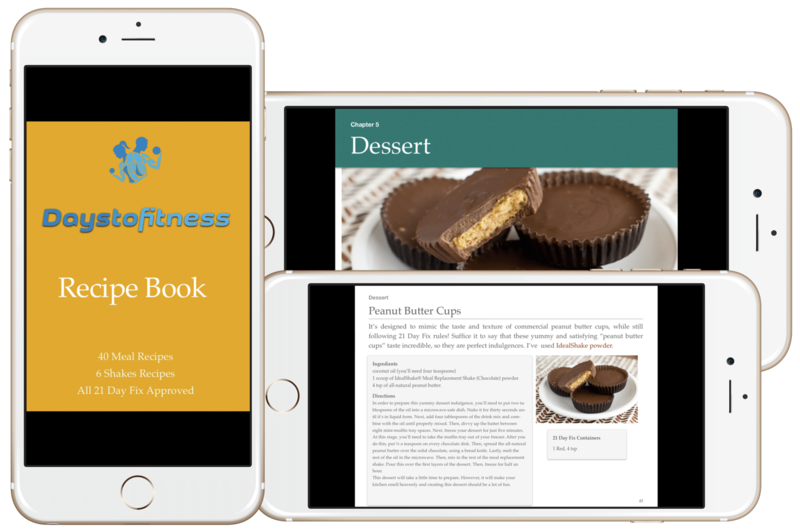 To download your own free copy of Recipe book 2nd Edition, you only have to enter your email address and subscribe to Days to Fitness newsletter. Can you list the serving and color measurements for these meals? The lunch meals do not have the containers for 21 day fix on it. your recipes look good, but you do not have the number of servings per recipe. also the burger recipe is missing the green and blue containers. Your website is really informative! After you make the tofu parmigiana, how much do I take as a serving size for that meal? I know you listed the containers (1 Red, 1/2 Yellow, 1/2 Blue, 1/2 Green) but with this recipe, everything is all baked in so I am unsure of what serving size to pack up for lunches. Thanks for your kind words. It’s been a while I’ve done this recipe, but if I’m not wrong those ingredients are for 1 serving. Give it a try to prepare and let me know if it’s too much for 1 serving, but I think not. It’s delicious that I remember 🙂 Have a great day.